Stock up and save with this bulk value pack! Aveeno Baby Wash and Shampoo, Lightly Scented 236ml each, pack of 4. 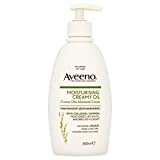 Aveeno Baby Wash and Shampoo, Lightly Scented 236ml each, pack of 4. Pediatrician Recommended, Tear Free, Lightly Scented, Pack of 4 of 236ml of Baby Wash and Shampoo. Fragrance free. With naturally active colloidal oatmeal. Moisturises dry skin for 24 hours. Daily Moisturising Lotion combines the concentrated goodness of finely-milled naturally active Colloidal Oatmeal with rich emollients. This unique formula is clinically proven to go beyond 24 hour moisturisation and replenish the skin’s natural barrier function, to significantly improve the condition of dry skin in just 2 weeks. Absorbs quickly and leaves skin looking and feeling soft, smooth and healthy. Non greasy. With colloidal oatmeal. Moisturises like an oil, absorbs like a cream. Moisturising Creamy Oil is formulated with the concentrated goodness of finely-milled naturally active Colloidal Oatmeal and Sweet Almond Oil, known for their moisturising properties. It combines the benefits of an oil with the convenience of a cream, helping to maintain the skin’s natural moisture level and prevent dry skin. Skin is left looking and feeling soft, smooth and healthy without a greasy after-feel. 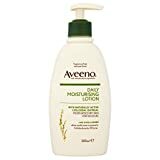 Aveeno – Baby Wash & Shampoo Natural Oat Formula Lightly Scented – 12 oz.